I don't know about you, but my spending always starts to go up and up and up starting in about August. There are Fall clothes to buy, family pictures to coordinate, costumes to buy or make and holidays to shop for. I don't usually do cash giveaways here on the blog, but I thought it would be fun to give ya'll the chance at such a fun prize. Can you imagine how exciting it will be if you win??? What would you even do with it??? We've joined forces with a great group of bloggers to bring you this fabulous giveaway. 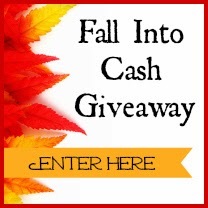 One lucky person will win $500 cash and five others will win $50 cash! Ends at 11:59pm EST on October 27th, 2013.